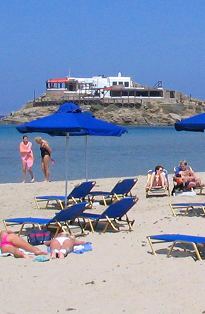 Studios Stratos are situated at a quiet and very convenient location at Saint George Beach, just 50 metres from the beach, only 100 metres from Naxos Town Main Square, 120 metres from the Post Office and 5 minutes walk from the port. 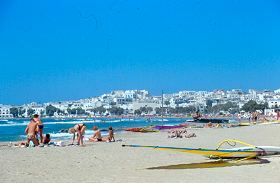 Saint George beach in Naxos Town is the first choice for beach holidays in Naxos Island, it has excellent tourist infrastructure and it offers a variety of beach entertainment. The beach is 1 Km long with fine sand and shallow waters which makes it safe for kids. The resort provides all kind of services may be required such as mini markets, laundry, car and motorbike rentals included. There are plenty of beach restaurants, cafes, snack bars and evenings at Saint George Beach is a unique experience. Studios Stratos are located a few metres away from all amenities, infact you have everything you wish at your steps.